Not all needs identification and process design aims at global social change. Still, I appreciate the effort and results. A recent example for me: I renewed my passport through the mail. The online instructions were clear and complete. The forms were easy to find and fill out. The fees were transparent and not exorbitant. The instructions said I should expect to receive my new passport in 4-6 weeks; it arrived in 3. I was initially surprised that my new passport arrived unaccompanied by my old one. I even ran a little mental dialog about, “I guess I shouldn’t expect the process to go so smoothly. I wish they would have said I would the mail-in process would eat my old passport.” But tucked inside my new passport was a little bookmark explaining that my old passport might be returned to me under separate mail. A few days later, my old passport, with stamps from Costa Rica and Japan and Ireland, arrived. It seemed like someone thought through the process, my needs and questions, and constructed a system to meet those needs and questions. They designed it. The passport itself has received some design updates, as well. The cover is made of stiffer material. That seems like a good improvement for durability. 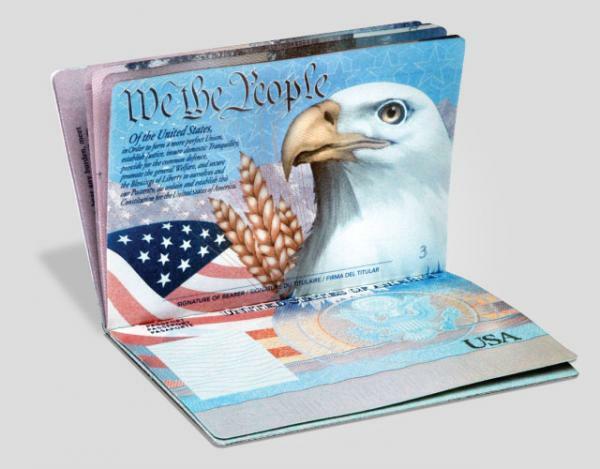 Since 2007, US passports have including electronic features built in to make travel easier and safer. The pages now feature imagery and sayings from U.S. history and geography: bison, the Liberty Bell, Mt. Rushmore. Some people are not happy about the new look, thinking it gaudy or overly promotional of U.S. cultural. I think of it as part of the brand visual language for our federal government. Has any smooth process recently made you stop and appreciate the thought behind it?